I was intrigued by this recipe – it included several of my favorites: apricots, burrata, pistaschios and balsamic vinegar. I came across this recipe as a part of a recipe review contest on Food52. The first part of the recipe called for making the honey balsamic syrup. In a small saucepan, mix the balsamic vinegar and honey, heat to a boil, and then simmer until the mixture is reduced. This took a bit longer than I expected, the recipe only specifies that it reduce to one third of the volume. I recommend about 10 minutes, but keep an eye on it so it doesn’t burn. I also ended up adding more honey then it called for. The recipe was overpowered by the vinegar and I couldn’t find the honey notes at all (I recommend adding at least another tablespoon of honey if you like that flavor to shine). The next step was to grill the apricots. Brush them with olive oil and sprinkle with salt and pepper. The recipe called for grilling them for five minutes on high heat. If you like mushy fruit, then leave them on for five minutes (my caveat to this is the flavor was good, I just felt they were to mushy). We grilled them over applewood causing the apricots to pick up some of that smoky flavor. Let them cool. 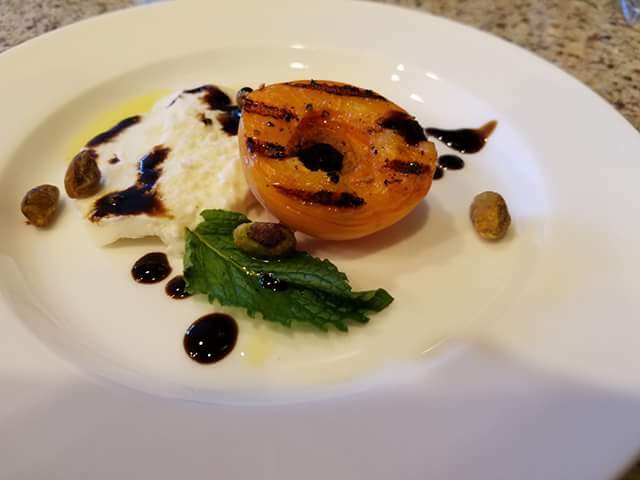 Arrange them on plate with slices of burratta, top with pistachios, drizzle with olive oil, and the honey balsamic syrup. Overall we enjoyed this recipe. The buttery flavor of the burratta pairs extremely well with the sweet, smoky flavor of the apricots. The honey balsamic opens up the flavor and the pistaschio adds a savory component to this rather sweet appetizer. Prepare the honey balsamic syrup. In a small saucepan over medium heat, mix the balsamic vinegar and honey. Slowly bring the mixture to a boil, and continue to simmer over very low heat, until the mixture is reduced to about one third of its volume, into a thick syrup. Remove from the heat and let the syrup cool completely (it will thicken more as it cools). Preheat the grill, grill pan or broiler. Brush the apricots with olive oil, and sprinkle them with salt and pepper. Grill the apricots over high heat, cut sides down, until gently charred, about 5 minutes. (If you are using broiler, preheat to high and broil the apricots, cut side up, for about 7 minutes.) Let the apricots cool completely. Arrange the apricots and burrata slices on a platter. Top with pistachios. Drizzle with olive oil and then generously with balsamic syrup. Sprinkle with extra salt pepper and serve. Add at least another tablespoon of honey to they syrup preparation. Reduce the grilling time to avoid mushy apricots. This might also be fabulous with a nectarine! This entry was posted in Appetizer, Gluten Free, Side dish, Summer Eats, Vegetarian. Another winner to add to the file! !